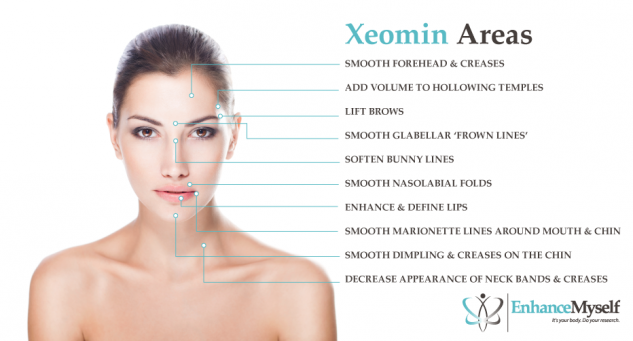 Xeomin Cosmetic (Wrinkles, Frown Lines), Cost, Recovery, etc. Xeomin is an injectable treatment to treat frown lines and other facial creases. Approved by the FDA in July 2011, many believe it will become a main competitor of Botox Cosmetic injections. Like Botox, this injectable contains Botulinum Toxin A. This filler works by blocking nerve signals sent to the muscles, paralyzing them and forcing them to become smooth. For patients, there is little difference between Xeomin and Botox. Some doctors prefer Xeomin because unlike most cosmetic injectables it does not require refrigeration. You may be a good candidate if you want to smooth facial creases caused by the muscles. These include ‘frown lines’ caused by the movement of the forehead muscles. It should not be used to treat ‘crow’s feet’ or other facial wrinkles not caused by the movement of underlying muscles. It is also used to treat neck muscle spasms (known as cervical dystonia) and eye muscle conditions such as uncontrolled blinking or eyelid spasms. Most adults in good overall health are able to undergo injections. You should not get this treatment if you have an allergy to botulinum, or if you have an active infection or rash in the treatment area. There are certain medical conditions and medications that can make you a poor candidate for injections; be sure that your doctor is aware of your medical history before treatment. You should not receive other botulinum toxin fillers, including more Xeomin, Botox, or Dysport within four months of being injected with Xeomin. This procedure typically takes place in the doctor’s office and usually takes less than an hour. The injection should always be delivered by a doctor, nurse, or other trained healthcare professional. Using a thin needle, Xeomin is injected directly into the muscle causing it to smooth. Depending on the area being treated, the process may include more than one injection to the same area of the muscle or to two different locations. Like other botulinum-based injectables, there is a risk of spreading outside the injection site. If this occurs, it can cause unintended paralysis of other muscles which in rare cases causes drooping eyelids, difficulty swallowing or breathing. Call your doctor immediately if you notice any of these side effects. Other risks include bleeding and bruising around the injection. Allergic reactions to the botulinum are also possible and can lead to swelling, itching, or shortness of breath. After treatment, patients are free to leave the doctor’s office and require no downtime. For this reason, cosmetic injectables are known as a ‘lunchtime facelift.’ Most patients are able to continue their normal daily routine immediately, including returning to work. During the first three days after treatment patients should avoid rubbing or touching their face as this can cause the injected material to spread to nearby muscles. It is also important to keep the head and neck elevated during this time. Although no side effects usually occur, some patients notice mild bruising or swelling around the injection site. It takes about a week for the full results to be visible. The results usually last for three to six months. DID YOU HAVE XEOMIN INJECTIONS? The cost of Xeomin injections is around $400 to $600 per treatment session. The range it costs depends on the doctor chosen and the amount of Xeomin needed to achieve the desired results. Different doctors in the same town may charge different fees for the same treatment.